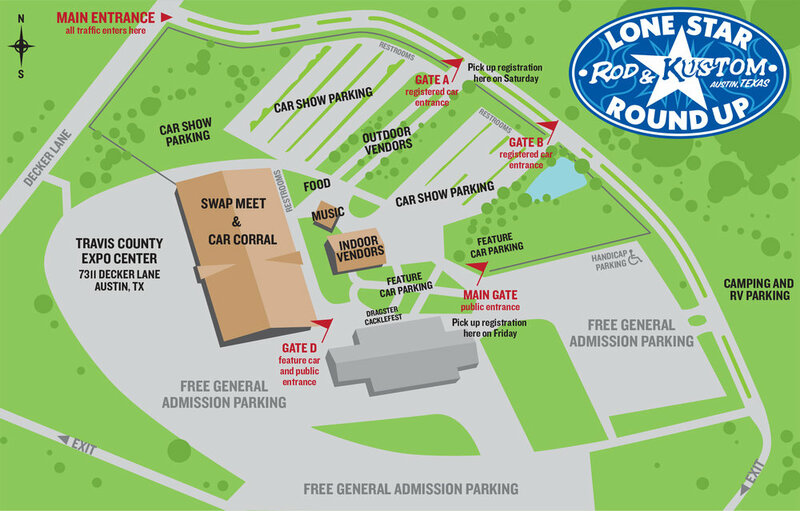 General admission spectator parking is FREE at the Expo Center. See map below for parking locations. Handicap parking is available near the main gate. Cost: $40 a night per camping vehicle, or $100 for all three nights. Camping onsite is available from Thursday – Saturday nights ONLY (no earlier or later!) please do not show up on Wednesday, you will not be let in. Camping begins at 10am on Thursday. No hookups, electricity or water are provided. Portable restroom facilities are available, no showers. Please remember, the Travis County Fire Marshal does not allow campfires or open ground fires of any kind on the grounds. If you need hookups - try nearby Oak Forest RV Park, down the road from the Expo Center. Download a printable version of the Expo Center Map here.